The purpose of the SGP is to represent and preserve the heritage of vintage racing in a competitive atmosphere while having fun and fellowship as a club. As voted on by the board of directors and stated at all of our SGPRC events, No driver will run away with any event and make that show look bad for the club, track, and fans. As long as you have a competitor racing with you, race as hard as you can. As stated strongly at our drivers meetings, if you break this rule more than once neither you nor your car will compete with the SGPRC at that race track for the rest of the season. IMPORTANT NOTE: At all of the SGPRC races, we are a guest of the track! If you have a problem or complaint with anything pertaining to our races at any track, SGPRC members are not to complain to track officials or the management. If you have a problem or concern you must find a SGPRC official and talk to them. They will try to help remedy the problem. There will be no discussion regarding club business at any race function between any member and a board member. SA rated and full face helmets are recommended for all competitors. Head and neck restraint system is highly recommended for all competitors. Fire suits are mandatory (recommended to be at least SFI 5 rated). Fire resistant underwear is recommended. Seats must be attached securely to the roll cage or frame. Lap belts must be 3 inch wide with a minimum of 2 inch wide shoulder belts and must be attached as per manufacturer’s recommendations. a. Belts must be no more than 5 years old. Rear view and driver’s side mirrors are mandatory. Mandatory firewalls front and rear of the cockpit are required. It is recommended that all holes be filled and sealed. Fuel cells are mandatory and must be in good condition. Any size permitted. Fuel cells must be securely fastened and be adequately protected during a collision. Fuel lines may be of a material other than metal if it is of the 250 psi type. All cars must have a catch can or overflow can attached to the radiator. No anti-freeze allowed on the racing surface. ** NOTE: some tracks may fine you if the find it in your car! Water Wetter or some other type of aftermarket cooling additives is recommended. Cars with bad fluid leaks, oil, water or grease, will not be allowed on the racing surface unless the problem is corrected. All Batteries must be securely fastened down. Lug nuts must be a minimum of 1 inch with large wheel studs recommended. All drivelines must have at least one safety hoop. Multiple are recommended. It is recommended that all drive shafts be painted white. Hoods and trunk lids must be securely fastened down. General Car Rules (All Divisions) - Cars must be American-made style race cars of vintage age from 1929 to 1975 that raced up until the early 1980s. The roof and all quarter panels of all bodies must be original appearing per the year of manufacture for both classes. The modified division will include, but not be limited to, Coupes, Coaches, Pintos, Gremlins and Vegas that would have been allowed in this time frame. Cars can be actual race cars that have been restored or accurate reproductions of cars that raced during this time period. No trucks or station wagons allowed. Fiberglass bodies that are true reproductions will be allowed. All cars must be dedicated to vintage racing and all cars will be subject to approval by the board of directors for the SGPRC. Radiators of any type are allowed as long as they are in good working order. Shocks of any type are allowed. Coil-overs are ok.
Rear ends of any type are allowed. Transmissions of any type are allowed. It is recommended if you are running a mini-clutch to have an explosion proof or steel bell housing. Steering of any type is allowed, except for chain driven gear boxes. Will allow a newer than 1975 model body if the car is at least a 30yr old documented racecar that adheres to all other class rules and is board of director approved. a. 10 inch rims only, any tire allowed. Frame tubing and roll cages must meet or exceed NASCAR specifications for size weight and strength. Roll cages must be securely welded to the frame. No uni-body framed cars will be allowed to run unless they are placed on a solid frame or a full tube style frame. No more than 4 inches of tire should extend beyond the rub rails or fenders on the rear of any car. It is recommended that all cars have substantial rub rails to protect the wheels to prevent unintentional wheel hopping! A minimum of 3 door bars in the driver’s door 8. A minimum of 2 door bars in the passenger side door. A minimum of 4 bars overhead. No black iron pipe or galvanized pipe allowed. No exhaust pipe allowed in the construction of the roll cage. Only V-8 or inline 6cyl engines allowed! No V-6 engines allowed. Any make or model allowed and mixing of make and model of car and engine combinations allowed. 23 degree cylinder heads only 3. Carburetors of any type allowed. Fuel injection allowed if it is of the type available in the fifties and sixties. Racing gas or unleaded gas only. Oil systems must be a wet sump system. No dry sump systems allowed in any class. Distributors of any type allowed. Modified Division Section - A vintage modified car shall be defined as an open wheeled stock car with either factory box frame or homemade tubular chassis that resembles the modified class racecars that ran up until the early 1980’s. It must be of original vintage styling. All the above general car and engine rules apply with the following specific class rules. Cars must weigh a minimum of 2600 lbs. with the driver after the race. No allowance for fuel burn off! Sportsman Section - A sportsman car shall be defined as a full bodied car with original style front fenders that may be cut for clearance. Bodies should be representative of what was allowed in the sportsman divisions from the 60s through the early 80s. All the above general car and engine rules apply with the following specific class rules. Perimeter chassis racecars must weigh a minimum of 3000 lbs. with the driver after the race with no allowance for fuel burn off. Any offset chassis racecar will have to weigh a minimum of 3100 lbs. with the driver after the race with no allowance for fuel burn off. All inline 6 cylinder sportsman cars will be allowed to weigh 2600 lbs. after the race with the driver and no allowance for fuel burn off. At any time the SGPRC board of directors can make changes to our rules for the safety and betterment of the club. These rules are not open to individual interpretation. If you have any questions about any of these rules please contact a member of the board of directors for final approval. If you do not know who the board members are, please ask or check out our website where they are listed with contact information. Aug 19, 2016 Marked the return of The Southern Ground Pounders Vintage Racers to the Bullring at Wake County Speedway. The threat of rain was a looming presence on Friday night but nonetheless a great field of cars showed up to run! Pitting in the infield is always a little exciting as no enclosed trailers are allowed so several cars unloaded and hauled there stuff out, but this is done so the fans can see the whole race track unobstructed! Congratulations to Maready for getting the Sportsman win after not running his car for a long time, and Jay Royal For capturing his first Modifed win sticker with the SGP! Great Debut for Todd Langdon and his new car and good run For Tatum coming from shotgun on the field to get to third on the tight 1/4mile bullring. If you guys think this place aint tuff, go look at the race videos from some of the club members posted on Facebook. This place is like racing in a fish bowl! Next weekend, Friday Aug 27, The SGP will invade the historic South Boston Speedway. Come See us at the races! Southern Ground Pounders, Often imitated but never reproduced. July was an eventful month for the Southern Ground Pounders. The Club visited East Carolina Speedway On July 9 and then went to the next week July 16 to Southern National Motorsports Park. Rain has accompanied the club about everywhere we have visited this summer. The east Carolina race saw a great event but as soon as we ran our race Mother Nature brought some rain. Rodney Dye claimed another Modified victory and Mack Tatum got the checkers in the Sportsman division. We then went to SNMP on the next weekend and rain eventually washed that program out! Greg Butcher brought his car out at SNMP after several tries to get to the track. The next event was at Motor Mile Speedway on Aug 6. The forecast for rain chances were very high leading up to this event that held several cars from making the long tow. Thankfully enough club cars braved the weather and a few visitors from the Carolina Classic Vintage Racing Association showed up to help fill the field. Wise old guy told me one time if you plan to never work based on the weather forecast you will never get anything done. Remember when they say 40% chance of rain that’s a 60% chance of no rain. In all actuality the SGP really dodged the weather at Motor Mile, but in the end the race got done and it was a beautiful night! At every event we run the track is always very happy with club performance and car count, but we still need every car we can get to the track. What a great show and the fans loved the event! We will be returning to Motor Mile next summer for sure! 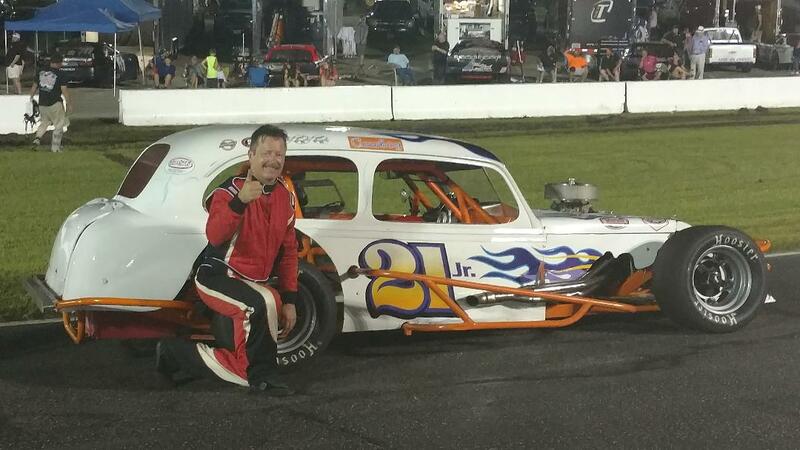 The Month Of august continues with the club Rolling in with return trips to the tracks of Wake County on Aug 19 and South Boston Speedway on Aug 27. The club expects good fields at both tracks with the potential of a couple new cars showing up for events! September will see us back at East Carolina on the 17 and Orange County on the 24. Catch us at the track! Southern Ground Pounders often imitated but never reproduced! The Southern Ground Pounders made their first trip to Orange County Speedway in 2016 and had a banner night with awesome racing. The pit gates opened to 13 cars including the #98 Falcon of Jeff and BJ Apple Driven by Jimmy Rice making its first appearance since a blown motor and crash at the Southern Vintage Racecar Nationals sidelined them in March. Past SGP Club member Gary Lloyd also made a rare appearance with the club in his #6 sportsman Falcon. Gary hadn’t ran with the club in several years but came well prepared to do battle with the Yellow #98 of Rice! Jay Royal from South Port NC also made the tow up from the North Carolina Coast! As always the starting lineup was determined by a blind draw! The green saw Jimmy Rice slip to the lead and start to pace the field. James Brown Driving for James Turner for the evening ran second for the first few laps till the field could get stretched out. After five laps the field looked like this. Rice, Dye, Lloyd,Brown Lassisiter, Dekraft, Kirkman Williamson,Tatum, Royal, Bond, Lambert. Gary Lloyd and his falcon was rolling to the front to catch Rice. There was great side by side racing all through the field with Dekraft Lassister Brown and Tatum running pretty much in a line till about lap 15 when the finally changed around a few positions. On lap 20 The Chevelle #12 of Dekraft had a motor decid to leave the building and a quick caution came out to check for fluids on the track. Tough Break For Jimmy as this was his second race with the club this year and he was doing great! Tremendous thank you to the staff of Orange County for having us be a part of their program Saturday night. During the pit party prior to the nights racing we had many many fans come down and get SGP calendars signed by the drivers on hand. Thank you to the Dedicated fan base that cheer on the club! The next event for the club will be at East Carolina Speedway on July 9 and then Southern National Speedway on July 16. Please come out and see the club and if you cant make it next time check us out on the web at www.sgpvintageracers and catch an event this summer. Remember, if you aint watching the SGP go support your local short track when they race! Keep your eyes on the Hot Rod magazine and Circle Track magazine Facebook pages for some really sporty pictures in the next few weeks! Would like to extend a big thankyou to Wake County speedway, Mike Stodder and his staff! The Southern Ground Pounders had a great time at the track Friday Night. We had a couple mechanical failures but all in all had a great race! It would appear that the SGP and Wake County have a rain tattered relationship! Over the last three years the weather and the SGP have struggled at the Bull Ring. We had all races rain out there a couple years back and then last year rained one out. actually it was just so wet we couldn’t get in the infield and the track was crying! The second time down there last year rain threatened but held off till the bomber race much the same as Friday night. Kudos to the staff for rolling through the program getting all the races in before the real rain came! We had ten cars at the track and one lone car show up at the last minute as Mack Tatum and his wife were burning up the road coming from Paris Island S.C. and his sons Marine Corp Boot camp graduation. Ken Faucette had his Camaro Modified back at the track for the first time since a hard crash at the Southern Vintage Racecar Nationals a couple years ago but a steering issue parked him for the night. The #t-5 Pinto had been through some mechanical redo’s and was running great in practice. It looked like Christy Jeffers was finally going to give the old mod a good run but leading the field to the green and taking off with all that horsepower that the little 283/301 antique motor has snapped the input shaft on the transmission! That slowed the bottom line and allowed Parsons Dye and Tatum to pull away from the field with Lassisiter Jefferies and Turner Bond Lambert in tow. The race ran pretty smooth with parsons leading the first five laps till the #9 of Dye went bye taking the #0 of Tatum with him. At lap fourteen the #58 of Lassister slipped in some water from a leaking radiator hose on Turners #51 Comet and spun in turn 4. The restart saw The Modified coach of dye pull two lengths on the Sportsman car of Tatum and five laps later another caution came out for the spin of The #81 coupe of Jefferies. The lightening was flying across the sky at this time and rain looked imminent but miraculously would hold off till the end of the program! The final Restart saw Dye Tatum Lassiter Lambert Bond Jefferies take the green and run to the Checkered! Rodney Dye in his #9 Coach collected the modified victory basically at his home track as he lives just a couple miles away. Tatum’s #0 Orange 1968 Nova finished second overall to claim the Sportsman trophy. Next event for the Southern Ground Pounders will be June 18 at the beautiful Shenandoah Speedway up in Virginia. Twin 20 lappers are planned for the night! Then the following weekend on June 25 we will be at Orange County Speedway in Rougemount N.C.
Again, a big thank you to the staff at Wake County Speedway for having the Southern Ground Pounders at the track Friday night! The day finally came where the SGP got back onto the track at the Historic South Boston Speedway. The club had 13 cars in attendance and had several that planned on making the trip but circumstances prevented it. One broken tow truck, one motor install got side tracked and a broken clutch release bearing cost the club some cars. The members in attendance had a great show! The race rolled off with Dyes Coach, #9 jumping out to a lead. After a couple laps of side by side racing the field settled out to Dye, Agee Parsons Staton and Tatum pretty much nose to tail. The rest of the field was a few car lengths back with Jimmy Dekraft #12, in his first run with the club leading the second pack followed by Bond, Jefferies, Rickets also in his first event with the club, Jeffers, Lambert and Turner. Turners Comet experienced a vibration and had to retire early. The front of the pack was a nose to tail freight train till about lap 10 when the ignition on Dyes #9 Coach failed relinquishing the lead to Agee followed by Staton, Parsons and Tatum. Parsons was putting some heat on the sportsman car of Staton and slid by then started the hunt for Agee who had pulled out by 8 car lengths. Time would run out and the race would finish caution free with Agee taking the checkard flag followed by Parsons Staton Tatum Dekraft Lambert Ricketts Jefferies Bond Williamson Jeffers and Turner! What a good night for the club and great night of overall racing at the historic South Boston Speedway. A huge thank you to the staff of the track for having us be a part of the weekly program. We can hardly wait to make a return trip back on Aug 27, 2016. The Southern Ground Pounder Clubs next event will be Sunday May 29 at Carteret County Speedway in Emerald Isle NC. Come see us at the beautiful facility they have down there. A special Saturday afternoon practice for divisions racing on Sunday will be held. If you are at the beach for the holiday come cool off that sunburn at the races! A good time is guaranteed! Southern Ground Pounders Vintage racing club! April 23 motormile race recap ! Southern Ground Pounder Motor Mile race recap! The SGP rolled into Radford Virginias Motor Mile Speedway on April 23 with a great field of racecars. The day was nice and sunny although it wasn’t hot, it was way warmer than the last event we had! Big thank you to Motor Mile Speedway for extending us the chance to come to their great facility and run a program with them! The track showed us awesome hospitality and a great time was had by everyone in attendance. Special thank you to the members who made the tow to the great track to have some fun someplace we have never been before! Special Thanks to Chad Conner for bringing out his new 1957 Chevy. They just finished up the car a couple days before the race. The track opened pit gates early Saturday and practice started at 1130 am right on the button! The club was afforded two rounds of practice with zero incidents. A couple gear changes and some chassis tweaking and we were ready to race! The race started with Sparky Staton in his red and white 1955 Sportsman car jumping out to the lead followed by Dye, Tatum and Turner. The Nova of Tatum and the Comet of turner ran side by side for about a lap and a half till goiung down the backstretch entering turn 3 the Drive shaft decided to leave Turners #51 Comet. James slid softly to the inside of three and four but the driveshaft landed in pieces on the track. After a short caution the field took the green flag again and ran caution free till the checkard flag fell! With Staton leading the way Dye and Tatum Gave Chase. The Chevelle of Faucette was working his way into the hunt for the lead also. Dyes Little yellow Ford followed Staton for a few laps till Sparky opened the door for Dye to go past on the inside. Faucette in the #7 got around Tatum and the top three cars of Dye #9, Staton#8 and Faucette#7 could be covered by a blanket. Tatum was running Fourth followed by Chad Conner in the #53 Jerry Jefferies #81 Jim Lambert #20 and Gene Williamson #16. On lap 23 The Motor in Faucettes Chevelle overheated and he had to relinquish his position on the racetrack to the fourth place car #0 of Tatum. The field crossed the finish line with Dye taking the overall win in his Modified and Staton getting the Sportsman win. Final finishing order as follows. The two winners received awesome trophies from Motor Mile Speedway! We will be returning to motor mile later this summer and expect a much larger field of cars. Special Thanks to the track for treating us so well. Looking forward to the return trip Back ! Race Recap from Southern National race on April 9 2016 ! What a great night to start the season. April 9 at Southern National Motorsports Parks opening night for 2016 and for the SGP. The afternoon was beautiful but windy and it wasnt to bad on temp till the sun went down! Two rounds of practice without a hitch! everybody line up waiting to go at the right times is an awesome perk for this club. No issues with waiting on someone as time is the enemy at the track especially during practice. 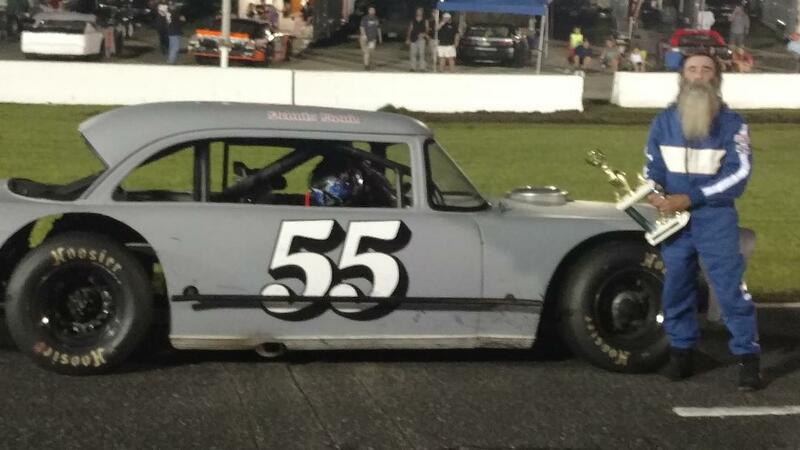 The race ran without incident seeing Rodney Dye win overall in the modified division and Mack Tatum claimed victory in the Sportsman division. Tatum took second helpings overall with Rodney Dye winning the overall race. The field rolled to green with ten cars. as we went green Don Lassiter experienced an oil pressure issue and played the safe bet pulling off. Even though the air was cold the track was hot! Rodney Dye was never more than a car length from the front bumper of Tatum the whole race. Dye and Tatum Paced the field but there was lots of racing following them at all positions on the track! Tatum tried put couldn't quite get around the outside of Dye. Dye drove a perfect race never faltering his line and never giving an inch off the bottom Lane thus making Tatum work the outside. Special thanks to all the vintage racers who braved the cold to show support to the club. Next race is Motor Mile Speedway on April 23. Be there or be square! !